- Dai 1-gō (Taishō 7-nen 1-gatsu 7-ka [Jan. 7, 1918])-dai 10024-gō (Shōwa 44-nen 2-gatsu 10-ka [Feb. 10, 1969]). - Although not published at a relocation center, served as a communication link between what was going on outside of the camps (regarding opinions towards Japanese-Americans)--and the day to day events that took place inside the camps. - Available on microfilm from the Colorado Historical Society, UCLA Library Reprographic Service, and the Library of Congress, Photoduplication Service. - In Japanese, Jan. 7, 1918-Aug. 18, 1942; chiefly in Japanese, some English, Aug. 20, 1942-Feb. 10, 1969. Kakushu jiji = Colorado times . Denver, Colo., September 1. (Denver, CO), Sep. 1 1945. https://0-www.loc.gov.oasys.lib.oxy.edu/item/sn83025518/1945-09-01/ed-1/. 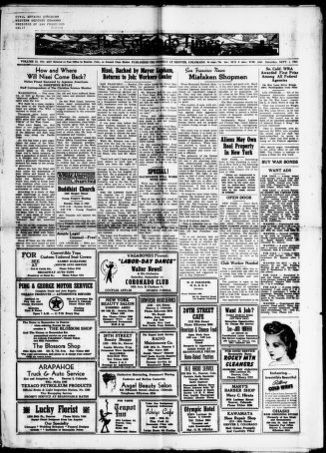 (1945, September 1) Kakushu jiji = Colorado times . Denver, Colo., September 1. Retrieved from the Library of Congress, https://0-www.loc.gov.oasys.lib.oxy.edu/item/sn83025518/1945-09-01/ed-1/. Kakushu jiji = Colorado times . Denver, Colo., September 1. (Denver, CO) 1 Sep. 1945. Retrieved from the Library of Congress, www.loc.gov/item/sn83025518/1945-09-01/ed-1/. Pilgrimage of Mary commandery, no. 36, K.T. of Pennsylvania to the twenty-fifth triennial conclave of the ... Author's name, C.P. Allen, in copyright notice, p. 203. Illustrated covers. Cover-title: To the Golden gate with Mary, 1892. Also available in digital form.